Bertold Hummel shows in his early Sonata for Violin and Piano, op. 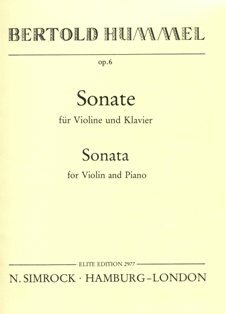 6, printed more than twenty years ago, that he is a full-blooded musician who has enriched the violin repertoire with this demanding and very effective piece. Two effervescent outer movements, ironically critical of tradition, form the setting for a deeply-felt slow movement, to be performed with rubato - the heart of this early work bearing the stamp of virtuosic pathos. Here, the best traditions of recent chamber music converge to form a valid piece, orientated less on the discovery of new-fangled effects than on the exploitation of all instrumental qualities. Hummel's Sonata in G for Violin and Piano, already performed in Berlin and other cities, confirms impressively once again the unusual talent of this Genzmer pupil. In it, the inspiration taken from this modern master are reworked in a most individual way, somewhat boisterous and bubbling over in the introductory Burleske, with occasional almost western elegance in the Finale. Between these, a central movement consists of a powerfully tense, extended Recitative and a classicistically brief Aria. The composer could hardly hope to find a more valid interpretation of his intentions than in this committed performance by the two artists (Francine Guignard / Wolfgang Fernow), whom one would have happily listened to playing the same work all over again. An early masterpiece is the Sonata for Violin and Piano, op. 6, composed already in his student days in Freiburg. The burlesque and dance-like elements of the sonata are as effective as its rhythmic élan and melodic invention. Out of the notes, refined chamber music speaks. Dots of sound alternate with powerful bow-strokes. In the "Recitative and Aria" of the middle movement, one perceives inspiration from the Baroque, but the form is classical, rounded-off, whereby the piano gains great independence. With this sonata, Hummel presents a concert piece that does not overshoot the character of both instruments. A strong talent revealed itself in the Sonata in G of the young Freiburger composer Bertold Hummel. The powerfully gripping outer movements and particularly the central movement, whose repeatedly soaring arches of melody are developed from an astringent opening chord. The programme ended with a new work by the already familiar composer Bertold Hummel, a Sonata for Violin and Piano full of bold and temperamental ideas, in which the reflective middle movement was particularly captivating. Here a young composer speaks his own language without compromise, a musician who has obviously battled mightily with himself and does not make things easy for himself or us, a composer capable of putting his technical ability at the service of a genuine initial idea and whose oeuvre will demand that we follow it with particular attention. Emil Maas (Violin) and Helmut Barth (Piano) committed themselves with complete dedication to the work.